Families Donation of used serviceable cloths to poor relatives of Tata Hospital Cancer patients. On 29 th August,2017, Members of Lions club of BOMBAY Parel alongwith Lion AP Mulgund and Lion lady Sarita Mulgund donated 150 kgs of various type of used cloths to a NGO named Jeevan Jyoti. This organisation serves the poor relatives of cancer patients admitted in Tata Hospital dwelling on streets as they could not afford the accomodation for themselves. This organisation provides them food, cloths, wraps and sometimes shelter also. On 6th October, 2017, Lions Club of Parel in association with CRMS and 5 other clubs jointly organised a Blood Collection Camp at Central Railway Railway Carriage Workshop at Matunga. The blood was collected by the Blood bank staff of Nair Hospital, Mumbai. The donors of blood who were Railway employees were honored with certificates and gifts from Lions. The activity was largely attended by District Governor, PDGs , District Dignitaries, Cwm of Workshop, their officers and large fraternity of Lions from participating clubs. Around 114 bottles of blood were collected on this day. On 14 the October,2017, Lions Club of Parel joined an activity with Lions Club of Bombay Central at CST Railway Station . The activity was the donation of stretchers to Railway Emergency help Services at CST Railway Station for use in case railway accidents or fall of passengers on railway tracks for immediate removal and fast transport of such accidental victims for medical help. The stretchers were officially handed over by DG Lion Pradip Parekh to Appropriate Railway staff. The Railway officers thanked Lions for providing need based emergency equipments to railway station. The activity was attended by Lions of District cabinet and clubs in large numbers. An interactive seminar on awareness of Organ Donation was organised at Central Railway Workshop Conference Hall in Matunga. An eminent Doctor Dr. Bhurke, Consultant Nephrologist and Kidney Transplant Physician, was the Key note speaker.He gave a wonderful audio visual presentation on organ donation. He enlighten the participants about what is organ donation/transplantation, which organs can be donated and under what circumstances, what is procedure and what are constrains. Legal, medical, social, religious, emotional, financial and other aspects related to organ donation/transplantation were explained and discussed. Participants were also apprised about a fact that how a number of lives can be saved by organ donation of one person. Audio video presentation was followed by very interesting interactive question answer session. Dr. Bhurke’s presentation on Organ Donation was very inspiring, interesting, informative, educative and effective. We are very confident that this programme will go a long way in creating awareness about importance of Organ Donation and will help in removing a lot of misconceptions related to this subject. Success of the programme can be measured by the fact CWM himself pledged donation of his organ followed by a large number of participants pledged their organ by formally signing Donor Cards issued by ZTCC (Zonal Transplant Co-ordination Centre). The Conference Hall was completely full and in excess of seventy participants were benefitted by the Organ Donation Awareness Programme. A group photo of all dignitaries holding symbolic Donor Card was taken for promoting pledging of organ donation. Participated in World Diabetes Awareness Day on 4th November 2017 at Grant medical College Gymkhana Marine Lines, Mumbai organised by PDG Lion Dara Patel. Very interesting and informative presentation on Diabetes Awareness was given by eminent Doctors Dr. Akshay Jain from Wockardt Hospital and Dr. Sahil N. Fulara Consultant Endocrinologist, hospitals Jaslok, Saifeee, Breach Candy, Wockhard. Diabetes Check-up camp was also organised on this occasion. Lion U.C.Gupta, T.C.S. Pillai, V.K. Yadav, R.C.Kedar, R.B. 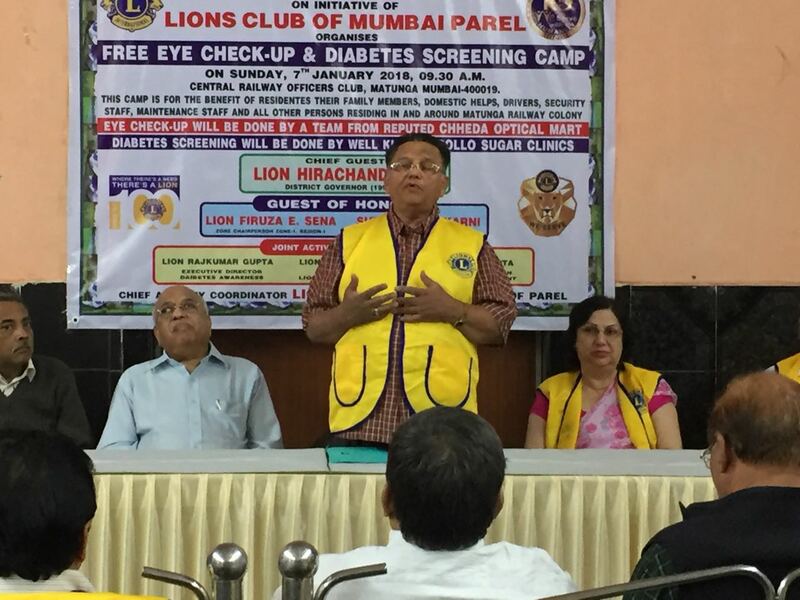 Jadhav and S.C. Pathak from Lions Club of Mumbai Parel Participated in this activity. Diabetes Awareness Programme was organised on 20th November 2017, 11.00 A.M. at Auditorium of Central Railway Carriage Workshop Matunga, Mumbai-400019. This activity was organised by Lions Clubs International through Lions Club of Mumbai Parel for the benefit of employees of the Matunga Workshop. This programme was organised as per instructions of Lions Clubs International President Lion Naresh Aggarwal for Commemoration of World Diabetes Awareness and achieving World Record through Guinness World Record. An eminent Dr. Bhavik Saglani M.B.B.S., Post Graduate in Diabetology U.K. Consultant Diabetologist Apollo Sugar Clinic was invited as Keynote Speaker. He gave a wonderful audio visual presentation on Diabetes Awareness. He enlighten the participants about symptoms, causes and effects of Diabetes. He also explained prevention, control and treatment of Diabetes. He also clarified certain misconceptions of Diabetes. Audio video presentation was followed by very interesting interactive question answer session. Dr. Bhavik Saglani’s presentation on Diabetes Awareness was very inspiring, interesting, informative, educative and enlightening. We are very confident that this programme will go a long way in creating awareness about Diabetes and will help in removing a lot of misconceptions related to Diabetes. Our programme started at 11.00 A.M. with brief introduction of Keynote Speaker by Shri Jaikumar Jaiswar followed by 40 minutes audio visual presentation and 10 minutes interactive question answer session by Dr. Bhavik Saglani. This was exactly as per guide lines received from Dr. Jagdish Gulati of Lions Coordination Committee of India Association. Total 184 number of participants attended the programme. A printed pamphlet of two pages containing very useful information about Diabetes was distributed to all the participants of the programme. Distinguished Guest Lion Ravindra Kadel District Governor (2015-16) administered Oath to all the participants to be cautious towards Diabetes and make everyone near and dear to them aware towards Diabetes. As a token of appreciation and remembrance an attractive memento was presented on behalf of Lions Club of Parel to Dr. Bhavik Saglani by Chief Guest Shri Rishi Lal Chief Workshop Manager Central Railway Carriage Workshop Matunga and our Distinguished Guest Lion Ravindra Kadel. Shri Jaikumar Jaiswar Operation Leader of Apollo Sugar Clinics in his speech appreciated efforts of Lions Clubs in spreading awareness, conducting check-up camps in association Apollo Sugar Clinics with whom they have an memorandum of understanding at all India level. Dr.K.B.K. Dora Additional Chief Medical Superintendent Mumbai Division apprised participants that India is now capital of Diabetes and it is spreading at an alarming rate and needs to be controlled on war footing. Lion Ravinra Kadel explained importance of taking regular medicine, treatment and due care of Diabetes by giving live and recent example of his mother and himself. Participated in 86th birthday celebration of PIP Lion Dr .Ashok Mehta .the celebrations were earlier followed by an activity known as MAD (Mutthi Anaz Daan) or (Make a Difference). Food packets were distributed at MMP Shah College, Matunga to hungry needy people under the MAD programme initiated by Lion Dr. Mehta. Hunger. The club donated an amount of Rs.1000/- for the cause. On the same day after serving meals to children, a 32" LCD TV was donated and installed in Balikashram for the entertainment and Education of the inmates of Balikashram. This was a Zone project. ZC lion Firuza and lions of other clubs in Zone attended this function. The Trustee of Balikashram praised Lions for their generosity and taking care of the entertainment and healthy development of deprived children. An Eye Check up and Diabetes Screening Camp was organised at Railway Officers' club, Matunga CR from 10 AM to 2 PM on 7/1/2018 for the benefit of local residents and their domestic helpers. The Eye check up and distribution of spectacles was manages with the help of Chheda Optical Mart and Diabetes screening was done with the courtesy of Apollo Sugar Clinic, Mumbai. PDG Lion Hirachand Shah attended as chief Guest, Lion Firuza Sena,ZC and Shri PM Kukarni, the president Railway Officers Club attended as Guest of Honor. Total 114 patients were benefitted with this activity. An Eye Check up and Diabetes Screening Camp was organised on Sunday,7th January,2018 at Railway Officers Club , Railway Colony, Matunga CR. About 114 residents of colny and their domestic helpers were benefitted. An image and Environmental project was carried out by beautification of open and exposed plane walls inside Railway Carriage Workshop, Matunga. Walles were painted with an Environmental theme coceptualised by the students of J.J.College of Arts, Byculla. A Lions Logo was painted prominentally inside as an Lions Image building Exercise. The place was converted into a green breathing space for the thousands of workers of this workshop. (See photos page). June,2018 A seminar on Environment protection was organised on 15 th June with an eminent Environmentalist Shri Subha not Mukherjee for the awareness of railway personnel at Railway Carriage workshop, Matunga.Audience were made aware to say NO to plastic and plant at least one tree per person to make their environment pollution free and green.